DILIsym is Quantitative Systems Toxicology (QST) software designed to be used during drug development to provide an indication of the potential drug-induced liver injury (DILI) hazard posed by individual molecules and/or to provide deeper insight into the mechanisms responsible for observed DILI responses at various stages of the development process. DILIsym is a “middle-out”, multi‑scale representation of drug-induced liver injury. It includes key liver cell populations (e.g., hepatocytes, Kupffer cells), bile duct cells (cholangiocytes), intracellular biochemical systems (e.g., mitochondrial function), and whole body dynamics (e.g., drug distribution and metabolism). DILIsym represents these biochemical and physiological processes for mice, rats, dogs, and humans, based on a substantial amount of publicly-available literature. Through the generation of SimPops® (a collection of simulated patients forming a simulated population), DILIsym also includes inter‑individual variability. DILIsym includes a graphical user interface (GUI) to facilitate in silico investigations. The GUI permits the specification of new simulated experiments, including compound, dose, dosing frequency, duration, mechanism(s), and species. Simulations can be performed on individuals or populations. Simulation results can be visualized within the GUI or exported for further analysis in other software. 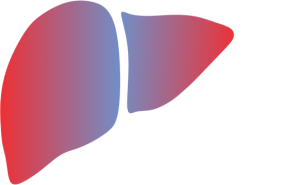 DILIsym prospectively supports key management decisions by providing information about potential drug-induced liver injury risk in upcoming experimental or clinical study designs, as well as mechanistic rationale for the underlying biochemical events that could cause liver toxicity. DILIsym also supports key management decisions about compounds for which liver transaminase elevations have already been observed by identifying patient screening or dosing protocols to mitigate risk. Additionally, DILIsym can mechanistically interpret existing data on liver transaminase elevations to predict the underlying level of hepatocyte loss and rate of liver recovery, supporting the distinction of innocuous vs. dangerous liver signals. 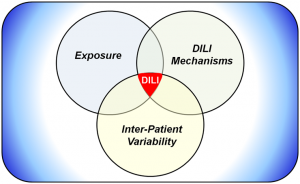 DILIsym has been developed within a conceptual framework (Figure 1), wherein liver compound exposure (parent and/or metabolite) can engage various mechanisms of intrinsic toxicity. The mechanisms currently included are: (1) inhibition of bile acid transporters leading to disruptions in bile acid homeostasis, (2) alteration of mitochondrial function, (3) generation of oxidative stress, and (4) cholestatic injury to bile duct cells via disruption in the ratio between phospholipids and bile acids in the bile. Alone or in combination, these mechanisms can lead to hepatocyte cell death via apoptosis or necrosis. Hepatocyte necrosis releases damage associated molecular pattern (DAMP) molecules, capable of activating innate immune cells (e.g., resident Kupffer cells). Activated immune cells produce mediators that may serve to amplify the ongoing injury and/or may promote liver regeneration. Immune cells may also accumulate due to ongoing inflammatory processes. Importantly, while the various elements described thus far can be sufficient to drive liver injury, they may also provide the setting in which an adaptive immune response can develop. Adaptive immune responses are not currently included in DILIsym but are part of ongoing development to be included in future versions of the modeling software. Figure 1. Conceptual framework for DILIsym development. DILIsym includes multiple sub-models which are solved in an integrated fashion to generate simulation results. Sub-models delineate compound absorption, distribution, metabolism, excretion (ADME) in a PBPK sub-model, various intracellular biochemical systems that may be impacted by compound exposure (e.g., bile acid homeostasis, mitochondrial function, oxidative stress), the hepatocyte and cholangiocyte life cycles, and stimulation of innate immune responses. To facilitate comparison with high-level clinical and preclinical readouts, DILIsym includes the release of biomarkers (e.g., ALT, AST, ALP) from hepatocytes in the event of cell death, as well as increases in total bilirubin, reflecting compromised liver function due to hepatocyte loss. DILIsym also includes emerging biomarkers (e.g., GLDH, miR-122, CK-18) that may provide additional dynamic and/or mechanistic information. More detailed descriptions of the sub-models are provided in the links below. Specific data used in design and development are available to licensees through the DILIsym modeling software documentation. Finally, DILIsym includes SimPops, comprising simulated individuals expressing variability in key parameters related to susceptibility to various mechanisms of toxicity. SimPops permit the researcher to consider the effect of inter-individual variability on drug toxicity. While not a sub-model per se, additional information is similarly provided for SimPops. DILIsym development is supported by a pre-competitive consortium, the DILI-sim Initiative, that includes DILIsym Services and multiple pharmaceutical companies. Member companies have a seat at the table in directing development efforts. The DILIsym development team receives regular feedback from member companies and from the Scientific Advisory Board, which includes key opinion leaders within the field of drug-induced liver injury. What are we providing with DILIsym? General population samples: The DILIsym software can be used to test compounds in simulated populations, termed SimPops. Simulated individuals within the SimPops express a wide‑range of response to the various exemplar compounds and can be characterized by extensive variability in their underlying biochemistry. DILIsym humans: A middle-out multi-scale representation of human physiology for assessing potential drug-induced liver injury (DILI) hazard in patients. Compound pharmacokinetic (PK) and pharmacodynamics (PD) information can be integrated to predict time profiles of liver enzymes (i.e., alanine aminotransferase, aspartate aminotransferase) and other clinical variables (e.g., bilirubin, prothrombin time, INR), as well as tissue properties (e.g., liver mass, GSH content). Alternate hypotheses regarding the downstream mechanisms of drug action can be investigated, including increased reactive oxygen/nitrogen species, ATP utilization, direct hepatocyte necrosis, and inhibition of bile acid transporters. DILIsym dogs: A middle-out multi-scale representation of Beagle dog physiology for assessing potential DILI hazard in dogs. Data from Beagle dogs were prioritized among the available datasets to maximize consistency in the representation. DILIsym rats: A middle-out multi-scale representation of Sprague-Dawley rat physiology for assessing potential DILI hazard in rats. Data from Sprague-Dawley rats were prioritized among the available datasets to maximize consistency in the representation. Compound pharmacokinetic and pharmacodynamics information can be integrated to predict time profiles as described above. DILIsym mice: A middle-out multi-scale representation of C57Bl/6 mouse physiology for assessing potential DILI hazard in mice. Data from C57Bl/6 mice were prioritized among the available datasets to maximize consistency in the representation. Compound pharmacokinetic and pharmacodynamics information can be integrated to predict time profiles as described above. Translational research: The ability to integrate your in vitro, small animal, and large animal compound data into a single platform facilitates translational research to better inform program advancement decisions, including experimental design, analyte selection, and timing of sampling. How is DILIsym being applied? What's new in DILIsym version 8A? DILIsym version 8A release webinar, Thursday, January 24, 2019 – Register here!